Ants are some of the most persistent pests that you deal with around your home. 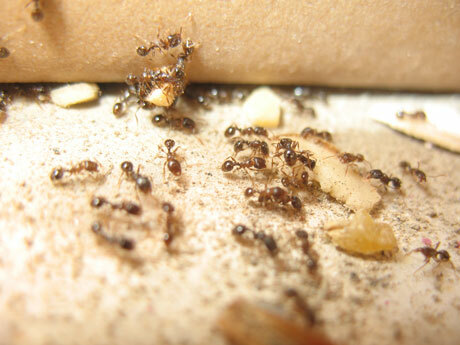 Leaving just one food item out overnight can bring the pesky ants marching into your home. Chances are if you see one ant, there are many more heading your way. In fact, ants reproduce so quickly that combining all of the ants on our planet would weigh more than combining all of the humans. These unwanted critters can be found nearly anywhere around the inside and outside of your house. If you live in Burnsville, MN and have noticed ants persistently throughout your home, it is time to partner with Eco Tech. Providing Burnsville pest control services for over 15 years, we can get rid of these ants for good! Ants do not travel or work alone. They reside in colonies that can consist of massive numbers. The largest ant colony ever reported totaled more than 6000 kilometers wide. There are nearly 12,000 classified ants, however, another 10,000 have not been identified. These pests will come marching for anything as they can lift and carry weight up to 50 times its weight. We can tell the difference between the various ant species and have the experience to handle their varying habits. Ant colonies can number up to 500,000, making it very difficult to get rid of ants the old fashioned way, like with ant spray you get at the grocery store. Those unhealthy chemicals may kill some of the ants, but not all of them. Additionally, a lot of the ant killers can be dangerous to humans and your pets. As your Burnsville pest exterminator, Eco Tech’s ant extermination treatments are all natural and safe for humans and pets. Our 5 Step Extermination Process That Works! Pick up the Phone – When you see signs of ants around your house, it’s time to give Eco Tech a call! Provide an Inspection – One of our dedicated ant extermination specialists will arrive at your home and do a thorough inspection of your residence, inside and out. Looking for nesting areas as well as visible ants. Time to Exterminate – Once the plan has been put in place, our team will begin the extermination process of the ants in your home. Thanks to our organic products used, you have nothing to worry about when it comes to being hazardous to your family. Repairs – If not managed timely, ants can cause significant damage to your home. If any damage is found during the inspection process, our crew can handle the repairs for you as well. Make Sure They Don’t Return – What good is getting rid of ants if a week later they are going to pop up again in your home? Eco Tech provides prevention methods to ensure that these unwanted pests invade your home again. We offer a 4 year warranty to back up our work! So, if you are looking for a pest control company near Burnsville, MN, Eco Tech is the company for you! Give us a call today at (763) 785-1414 and let our team hit the ground running by tackling your ant problem!